Students work on a variety of rolls, jumps, strength, and obstacle course training in a disciplined and focused setting. Class features: Warped wall, hanging wood grips, countless mat obstacles, trampoline, daily challenges, and strength. 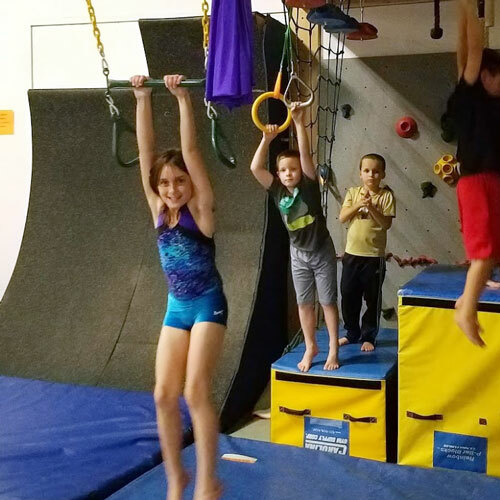 Our hour-long homeschool class features instruction on all Olympic events, plus trampoline, and gymnastics-inspired fitness activites, all in a fun & safe environment. Students are divided by age and skill level, enrollment permitting. Sorry, no discounts. A Yearly Registration Fee of $12/$20 per Family is required. A one hour “express” class for boys and girls ages 6 - 12. Instruction will cover Class 1-4 skills and incorporate strength, coordination, and obstacle course training. Reduced tuition is based on three classes per month to accomodate busy schedules - take a night off guilt-free or get a great deal by attending every week. Summer Session Priority Registration Runs February 15-20. Log in To Your Customer Account to Enroll.